CleanMyMac 2.3b1 – Delete files that waste your disk space. Preliminary support of OS X 10.10 Yosemite Public Beta. Improved Safari Extensions naming. Updated Safety Database to version 1.18. Uninstallation survey added. Bugs fixed: Fixed scanning of hidden /Users folder in Large & Old Files. Fixed minor UI issues and crashes. Known issues on OS X 10.10 Yosemite: Possible complications with PadLock authorization. Possible inability to manage Safari Extensions and Login Items. Mostly button-related user interface issues. Next story MacCleanse 4.1.6 – Selectively erase logs, caches, activity, and more. Previous story MindNode Pro 1.10.6.1 – Elegant mindmapping application. FastTasks 2.49 – The troubleshooting app. 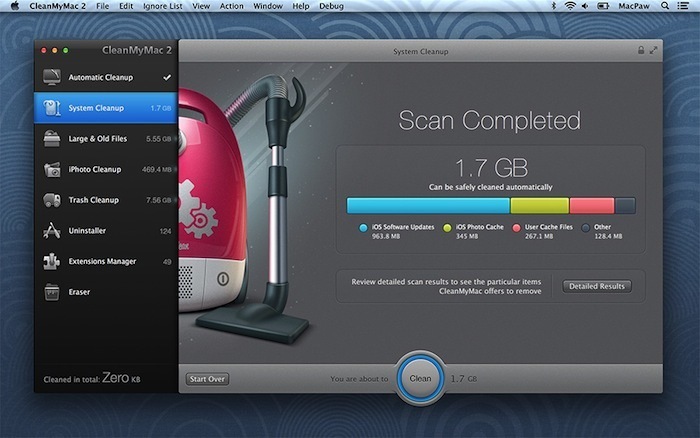 CleanMyMac 2.3.1 – Delete files that waste your disk space.